Use your mushrooms within a couple of days. Wipe off your mushrooms with a damp cloth, or rinse in cold water. Always keep your mushrooms in the refrigerator. Do not wash your mushrooms until you are ready to use them. 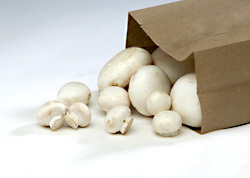 Store your mushrooms in a brown paper bag. Do not be alarmed by particles of peat moss that may be on some of the mushrooms.